Indie Retro News: H.E.R.O II - Original C64 action classic overhaul gets a new v2 preview! H.E.R.O II - Original C64 action classic overhaul gets a new v2 preview! Sometime back we mentioned the work in progress enhancement of the original C64 game of H.E.R.O, which was first released way back in the 1980's for the Atari 800/2600, ColecoVision, C64, C128, and Sinclair ZX Spectrum. Now titled as ' H.E.R.O II ', with updates by the same developer Retrofan who is behind the upcoming Bombjack remaster. Has felt that the original was lacking in the graphics department as it looked and played hardly any better than the Atari 2600 version. As such also thanks to maltes they have decided to make it look so much better as an overhaul, that is previewed in the second update version released by Raiders of the Lost Empire. 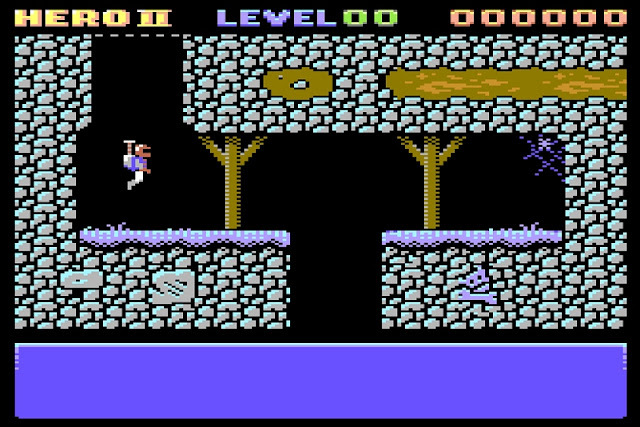 In this classic game you play as ' Roderrick Hero ' and must search the cave system for the miners of Mount Leone, who have been trapped deep below after a recent volcanic situation that has occurred. As for this remaster, graphically it's far superior to the original game even at this early stage, it's just a shame from my experience you can only visit a couple of screens, fly about and shoot. But at least you can take in how good the graphics now look including the character animation.